Come on now! 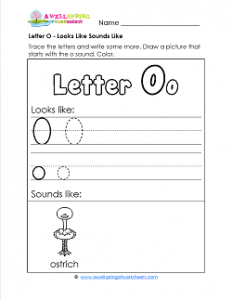 Let’s get pumped up about this letter o looks like sounds like worksheet! Kids get to practice writing those O’s nice and curvy like an oval (the uppercase O) and a circle (the lowercase o). At least three per line please. Neatness counts! Then with your help, they can come up with something to draw that starts with an o. It can be anything – from an octopus to an onion. Remind them to do their best and, of course, to color.